Le Caribe 505D est un condo de 3 chambres à coucher et 3 salles de bain pouvant accueillir jusqu'à 10 personnes. Ce magnifique condo de 3 chambres à coucher, 3 salles de bain à The Caribe est situé au 5ème étage sur le côté très recherché qui fait face à la baie. Le Caribe Resort propose des piscines à plusieurs niveaux, d’énormes toboggans, une rivière artificielle, une marina sur place, un accès à la plage, des piscines intérieures, des bains à remous, des restaurants, des centres de remise en forme, un green, des courts de tennis et plus encore! La station est front de mer avec accès à la plage. 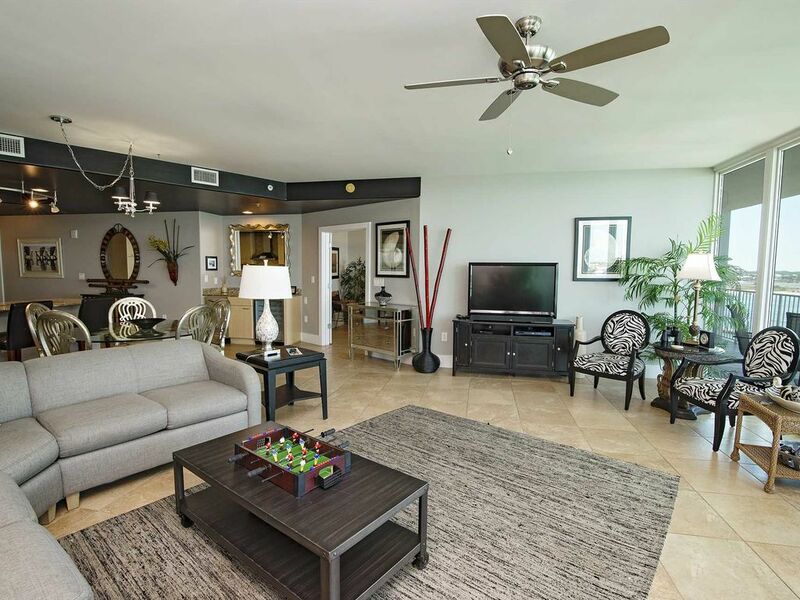 Ce condo offre une vue imprenable sur Orange Beach sur l'eau. Chaque chambre dispose d'une télévision à écran plat. La chambre principale et le salon offrent une vue magnifique sur la baie. Vous trouverez également une télévision à écran plat dans le salon. Loved the condo. Had to request clothes hangers. Also would be nice to have some basics like salt and pepper available in kitchen. We have stayed at the Caribe before, but the first time facing the bay/pass area and loved it. 5th floor level was a great level to view the water. The condo was clean. I enjoyed all tile floors. The furniture was nice and updated. Kitchen was well furnished. Liked having the 2 double beds in one room. The deck was well furnished. We would rent this condo again and would recommend it!!!!! The bay views units are the best!!! Great pools and great views. This condo was very nice and roomy - we had plenty of room for the grandkids too. The kitchen is the bomb, we had a fish fry, and the balcony was a pleasure. We could see stingrays, dauphins and the boat slips from the balcony. The boat slips are so convenient if you have boat. The resort offers so much you don't have to leave, just bring your groceries and you are set. We will definitely visit here again. Property was not well maintained. Unit was just surface cleaned, dirt under furniture and had a dehumidifier in laundry room that had so much dust on it that you could have written a message in it. Bedspread had stain and one bedroom had no furniture that had any drawers for clothing. The pool at "D" building had wooden deck that had several bucked boards and had several broken wooden chaise chairs. Why! Would you not remove broken patio furniture? Indoor pool at "D" building was freezing,but other indoor pools were heated. The hall way to our unit had potato chips and paper that was there all week. Do they ever vacuum the halls? Our unit had an old refrigerator,not the one that was built in. The balcony never has sun nor can you see sunset or sunrise. The entire property is poorly maintained. The painted concrete at entrance was very worn or dirty, as was the carpet on main floor. Lastly, long waits at security entrance,thought it was just someone needing help the first time it happened,but every evening we were 4 -5 cars deep waiting to enter into security gate. Worse system I've seen and this was not peak season. Property mgmt company could learn from other mgmt companies. Had friends there at same time but different mgmt company and had key lime pie in refrigerator and a welcome note with information sheet about property. I cannot recommend this property.